My thoughts go out to legendary Sandy Gallin, under renewed attack by blood cancer in the ICU at UCLA Medical Center and that he can tap some of the same strength and confidence he’s shown in life so far. I don’t know him well, but we crossed paths for a while in the 90s including some memorable times at events, the beach, and getting to help his “roommate” Dolly Parton put her shoe at the top of the Christmas tree in their New York apartment while there for drinks with a friend. Author Kevin Sessums knows him well and describes him as “kind and kinda kooky and crazy talented.” For a long time one of, if not “the”, top managers in Hollywood with a client list that has included his roommate, Cher, Neil Diamond, Barbra Streisand, Mariah Carey and Michael Jackson. He later segued into his current career as a successful real estate entrepreneur and designer. 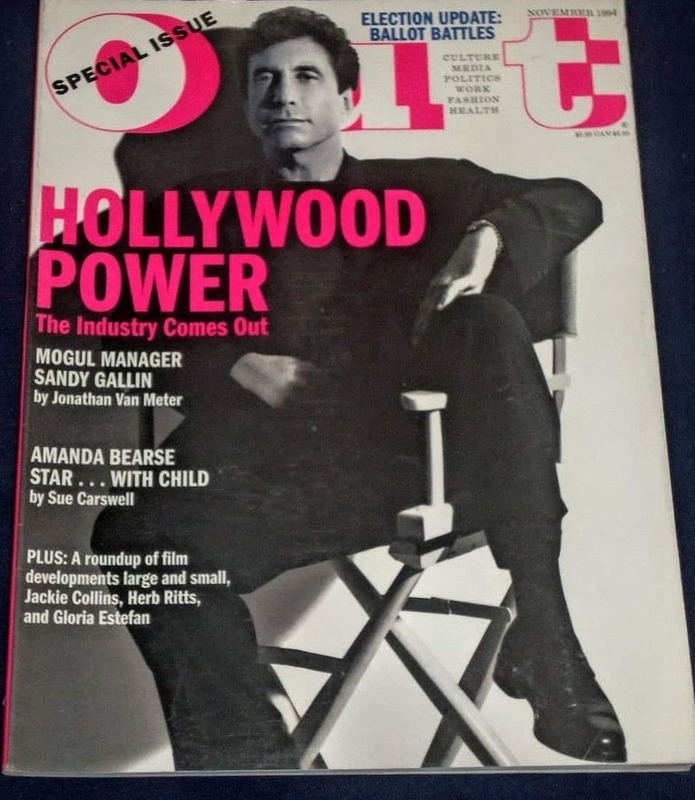 I’m still thankful for his support in what turned out to be our naive decision to do a Hollywood Power issue at Out in 1994. Sandy ended up the ONLY one on our target list who would be featured in the issue. He just said “Yes” and joked in the interview that in addition to getting to be a role model, he might find a boyfriend. If only because of how many others didn’t do it, this was brave thing at the time. Jonathan Van Meter of Vogue and Vibe did the interview and Sue Carswell of People landed a competitive Amanda Bearse interview. The supporting star of Married With Children had recently come out and it’s a sign of the times that it was big news. SANDY GALLIN ended up the ONLY one on our target list who would be featured in the issue. At that point not a single Teen Wolf was out. I didn’t know Dougie Houser’s real name. And though Ellen came out 20 years ago today and was treated poorly by the industry for years, that was three years after this cover. It would be another 4 years before George Michael came out and another 16 years for Ricky Martin. David Geffen, Clive Davis and Anderson Cooper? NopeWe had a hard time finding cover subjects each month. Diving into this cover, Sandy Gallin supported our start up, and had a message for those blazing the trail on their own terms, that they should keep going, that things were changing, and to feel some encouragement. I hope he finds whatever strength and other support he needs now. i am Michael Goff, Andy Towle’s business partner in Towleroad. I was was founder and Editor-in-Chief of Out magazine for much of the 1990s. I initially put this out there as a Facebook post.